This is Archimantis latistyla, commonly known as Stick mantis. There are approximately 10 species of this genus. The insect order Mantodea or mantises consists of approximately 2,300 species worldwide in temperate and tropical habitats, of which a majority are in the family Mantidae. For most of the past century, only this single family was recognized within the order, and the term "mantid" was therefore historically used for any member of the order; technically, however, the term only refers to this one family, meaning the species in the other eight recently-established families are not mantids, by definition (i.e., they are empusids, or hymenopodids, etc. ), and the term "mantises" (or the more colloquial "praying mantises") should be used when referring to the entire order. 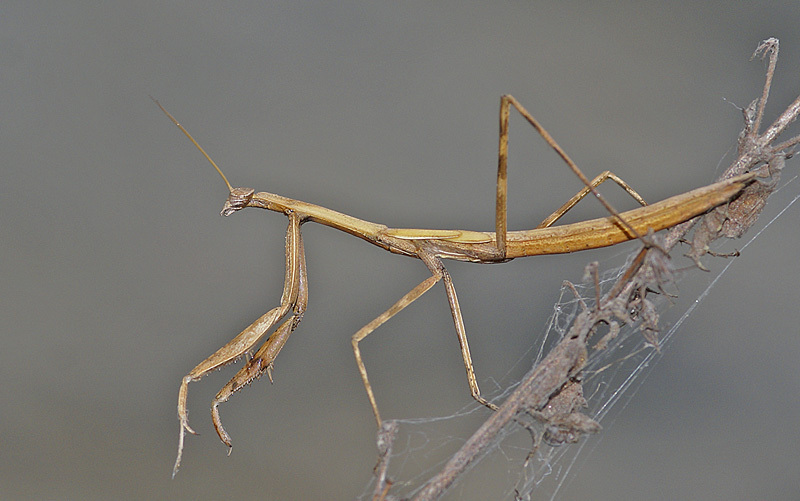 Often mistakenly spelled preying mantis (an eggcorn, since they are notoriously predatory), they are in fact named for the typical "prayer-like" stance. The word mantis derives from the Greek word mantis for prophet or fortune teller. In Europe, the name "praying mantis" refers to only a single species, Mantis religiosa. The closest relatives of mantises are the orders Isoptera (termites) and Blattodea (cockroaches), and these three groups together are sometimes ranked as an order rather than a superorder. I really like this mantis, posing as you want to see him. Good focus and composition. Thanks. Hi, beautiful photo of the mantis, do you think it's the latistyla sp. ? It looks differnt in a few key areas to the "latistyla" version we have here in NSW Australia.